Barry Barclay was a pioneer in the global indigenous film movement. His socially and politically incisive documentaries and dramas stand as towering landmarks in the history of native arts and sovereignty. His thinking about indigenous intellectual property rights influenced generations of artists and paved the way for a new paradigm of film making. Mana Tuturu: Maori Treasures & Intellectual Property Rights, 2006 – seminal book on indigenous arts and cultures as taonga. Barry was honored as a Member of the Order of New Zealand in 2007. 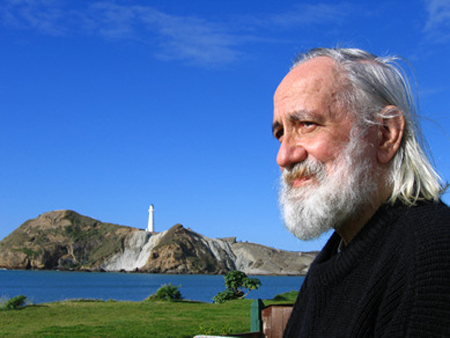 He died at his home in Hokianga, Aotearoa, on 19 February 2008 age 63. Barry’s body was returned to his turangawaewae at Whangaehu Marae in the Wairarapa. Kia ora, Barry. Your work remains full of “first” and “bests.” You made an impact that no one can deny. Your labor on this earth resonates across all beings, human and other-than. Thank you for the films, the writing, the generous “spirit” (wink) you brought your work. Thank you for the invitation to learn from you, your people, and your land. I promise I’ll take you up on that invitation if others feel they wanna honor your request that I visit personally to talk more about things and non-things Maori. Thank you for reading my review of your work as positive and as continuing a conversation, even if other readers misinterpreted my intentions there. Many of us will be carrying forth your good intentions and joyous struggle. And many of us will do so in memory of you. Naku noa. We were fortunate to spend some time with Barry during his frequent visits to Honolulu. The first time we saw him was at the after-film Q&A when he brought his film NGATI to the Hawai’i International Film Festival in 1987. During the screening, we were overcome with the experience of watching for the first time a feature film that portrayed a Polynesian point of view. Immersed in the beautiful footage of the land and people of Aotearoa, watching brown faces on the big screen, hearing Maori language and chants amplified over the theater sound system, and seeing Polynesian values, humor and traditions enacted so naturally –- by the end of the film, we could hardly see the screen for the tears in our eyes. Afterwards Barry met with us and shared tapes of his documentary series TANGATA WHENUA — another feast for the eyes, ears and spirit and an inspiration to us as documentary-makers. He told us how he directed his production crews to work with a different ethic and attitude, one that respected those whose images and words were being recorded. He talked about forming Pacific-wide networks of film and video makers and of traveling indigenous film festivals. Barry wore a traditional feather cape for the festival awards ceremony. We couldn’t believe an Iranian film won instead of the nominated NGATI, especially in a film festival situated in the middle of the Pacific. We saw Barry again at the Aotearoa Film Festival in Tuhoe in 1993 where he held forth in a panel discussion concerning the dearth of government support for indigenous story-telling. We hung out with the Maori elder who came to represent Barry’s doc, THE FEATHERS OF PEACE, at the Amiens (France) Film Festival in November 2000, an elder whose role in the production had been to bless the location and crew before filming every day. The next thing we knew: there was Maori TV !! Every day when we come out of our bathroom shower, Barry smiles straight at us from a wall-mounted photo montage of the Aotearoa film festival, a look of perpetual amusement in his eyes. Barry was a humble and generous person and greatly shaped the ethics and aesthetics of filmmaking in the Pacific. His love of life was inspiring. His last letter to us was written from a small, isolated “writer’s house” by the ocean where he was working on a novel. He described his two-hour daily beach walks with nobody else in sight, just the sun, wind and wildlife.